This is a project about native and osx. 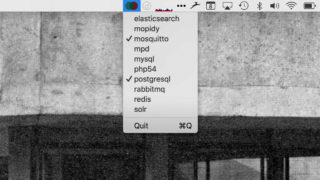 A small macOS menu bar app that allows you to quickly enable and disable services managed by homebrew. I explored Swift and macOS development to solve a common problem when you work with on projects with different technology stacks. I didn't want to have services such as MySQL, Redis and RabbitMQ running all the time. brew services allows these services to be started and stopped on the command line. This wraps it in a handy menu bar app. Download the app here or read more about the background.